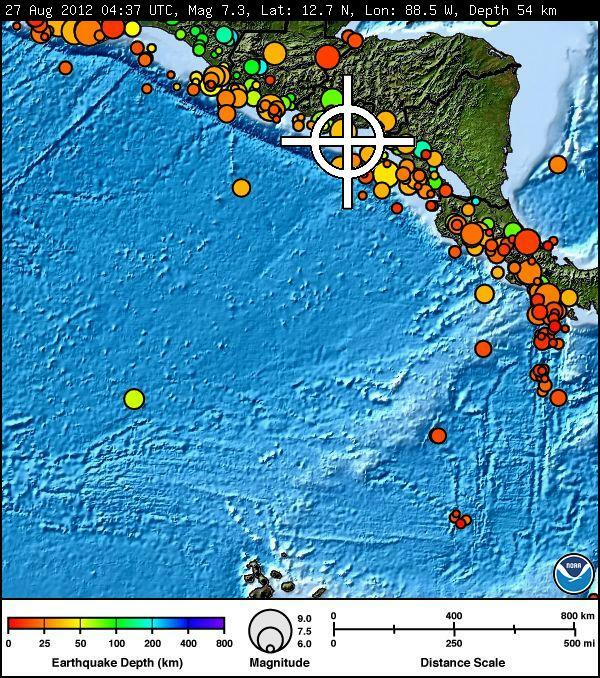 Massive M7.3 earthquake struck offshore El Salvador on August 27, 2012 at 04:37:23 UTC. 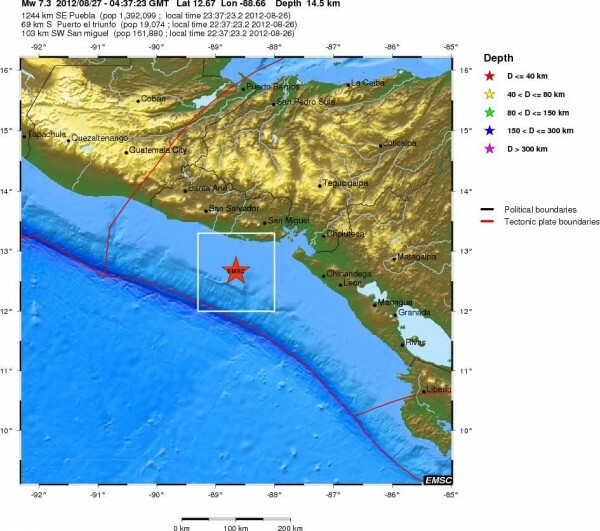 The epicenter was located 118 km (74 miles) S from Usulután, 138 km (86 miles) SSW from San Miguel and 169 km (105 miles) SSE from capital San Salvador (12.279°N, 88.530°W). The depth of epicenter was 52.9 km (32.9 miles). USGS reports a M7.4 at depth of 53 km, Geofon reports a M6.6 M7.1 at depth of 10 km and EMSC a M5.2 M7.3 at depth of 14 km. USGS first reported magnitude 7.4 then later downgraded to 7.3. Biggest difference after evaluation was depth where they changed it from 52.9 km to 20.3 km (12.6 miles). At 05:01 UTC aftershock with recorded magnitude of 4.6 and depth of 19.9 km was reported by USGS. At 05:38 UTC another strong aftershock with magnitude 5.4 was recorded. Depth was 57.8 km (35.9 miles). 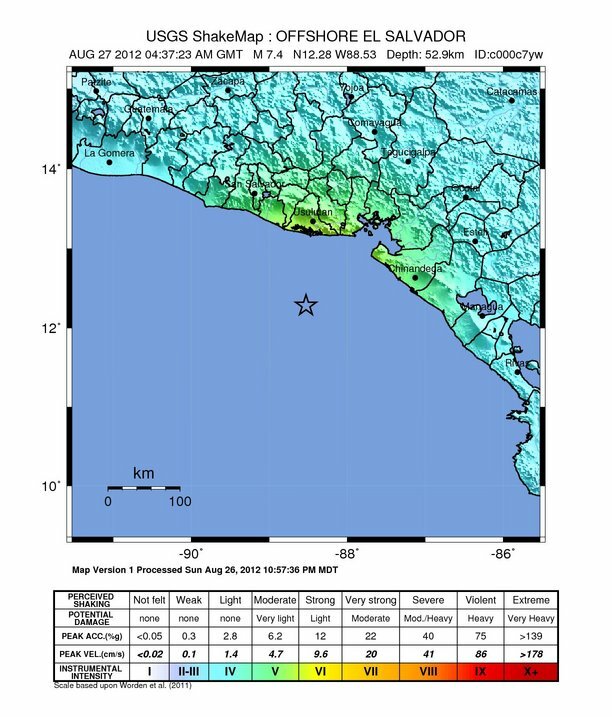 Pacific Tsunami Warning Center issued a tsunami warning for Costa Rica, Nicaragua, El Salvador, Honduras, Guatemala, Panama and Mexico. They stated that it is not known that a tsunami was generated, however, an earthquake of this size has the potential to generate a destructive tsunami that can strike coastlines in the region near the epicenter within minutes to hours. NOAA West Coast and Alaska Tsunami Warning Center didn't issue any warning. Buoy Station 43413 - 360 NM South-Southwest of Acapulco, Mexico is in tsunami mode.